Almost everyone can remember where they were the first time they heard a Garth Brooks song. Whether it was “The Dance,” “That Summer,” or any of Garth’s other chart-topping hits, we’re guessing that if you’re a country music fan you’ve been impacted in some way by his music. Garth Brooks emerged from the 1990’s as one of the best-selling artists in the world with more than 160 million albums sold. The success of those albums can be accredited to Brooks’ uncanny ability to choose songs and to deliver them in a way that only he can. Garth has also proven to have the ability to produce some of the most dynamic music videos in country music history. In 1994, “The Red Strokes” was born. While it was never released as a single, the dramatic and mesmerizing video for the tune was enough to get the song on the country charts. Once you see the video we’re sure that you’ll agree that it puts Garth in a class of his own as few artists are willing to go through what Brooks went through to see his dream for the video come alive. Filmed in a warehouse in Nashville, the opening sequence shows Garth emerging from a pool of red paint. The scene was filmed in reverse with Garth being lowered into the paint, something the singer admits made him a little bit uncomfortable. 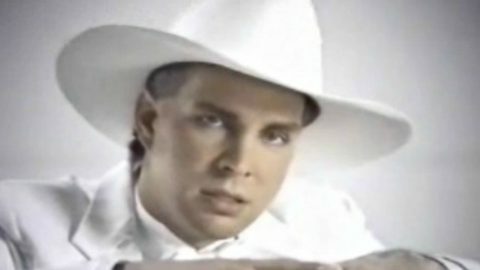 As the video progresses, Garth begins to sing as he sits alone in a white room, wearing a white tuxedo, and playing a white grand piano. Eventually the singer and the piano are doused in red paint, something that wasn’t added using special affects. In fact, 6 baby grand pianos were destroyed during the making of the video. It also required 18 white tuxedos, 12 white Stetsons, 5000 gallons of paint, and six days of filming. The video won Garth the ACM Top Video of the Year Award in 1995. Watch Garth Brooks’ mind-blowing video for “The Red Strokes” by clicking here.